While we have over 100 reviews on Trip Advisor, they have changed the name of our listing under our umbrella company Art Deco Tours in "Miami". Be sure to come back here to book your tour. Using Viator (booking platform on Trip Advisor) has additional costs. Booking directly with us is recommended for savings and extra perks. FIVE STARS to you, the tour & Annelise! Thank you so much for creating such a wonderful authentic tour. I enjoyed Anneliese’s professional, warm and friendly approach to the art, culture and people we encountered. 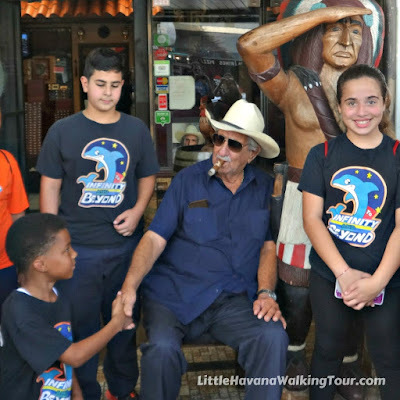 The Little Havana Cultural Tour is the experience for people who want to connect to the fabric of the neighborhood, the delicious Cuban food and the rich history of the area. Although, I purchased small bits of pottery, coffee and art, the real take away is the colorful knowledge Anneliese provided on the tour. I hope to return and experience your other tours and reconnect with the Agustin Gainza Arts & Tavern and Anneliese. We would give 10 stars! Expectations were exceeded. Originally took the culinary tour with guests. Signed up again with guests visiting from out of town and it was cancelled. So glad we found this Little Havana Cultural Tour. It was even better plus we got to see more, eat more and pay less! It is the best deal. When we saw the Big Bus tour groups and culinary tour with big group and loud speaker we were so relieved to be on this tour with few people (there was 5 total) and loved the VIP treatment. We got into places most tours don't have access to. Locals clearly adore our guide Christine and so do we. Don't miss this tour! Our tour was 5 out of 5 - would rate it even better if possible. We had a great time and got a lot of knowledge of Cuba, the Castro times, and the people in Little Havana. If we ever come back to Miami, we are certainly going to book some other tours from your office. I am actually now checking the photos from our tour, and having some nice memories! Our guide Christine, made the tour for us! What a terrific person! I was running late and was not happy re: holding everyone else up. But she was gracious and allowed me to catch up. She picked key stops in this fascinating neighborhood to give us a near perfect overview within 3.5 hours. The area is a fund of history - I'm definitely going back to Little Havana. This was a memorable tour where Christine brought to life the fascinating history of this working class neighborhood that was once the proposed Hollywood of the south for movie-making films. As history and cultural buffs we immensely enjoyed this tour. Christine thoroughly presented the struggles of Cuban immigrants, the cultures and traditions carried over, and the firework politics from Cuba to Miami to Washington will expand your knowledge and heighten your awareness of the constant debate of US policy toward the communist island just 90 miles away. It helps to have a tour guide that speaks Spanish. We sampled a Cuban sandwich (delicioso!) and tried pure sugar cane juice and the market owner happen to be there and explained the difference in the coconuts. Who knew!" Copyright © 2008-2017 Little Havana Walking Tour. All Rights Reserved.